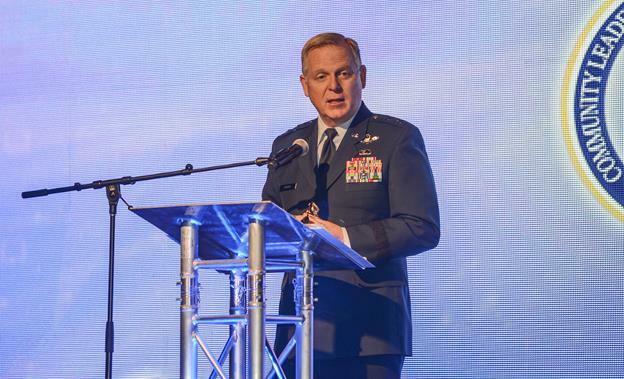 EDWARDS AFB — The Antelope Valley Board of Trade held its 44th Annual Business Outlook Conference Feb. 26 at the Antelope Valley Fairgrounds. The “AV Rocks” themed event featured a variety of speakers, including legendary businessman and musician Gene Simmons. Several speakers shared their thoughts on improving business in the Antelope Valley and told success stories demonstrating their positive economic impact in the community. One of those speakers was Maj. Gen. David Harris, Air Force Test Center commander at Edwards Air Force Base. According to Harris, Edwards Air Force Base is the largest employer in the Antelope Valley with over $520 million spent annually in payroll. Contractors account for over $300 million and the value of the indirect payroll and jobs created amounts to more than $660 million. That creates a total of $1.49 billion in economic impact to the Antelope Valley. To demonstrate just how that economic impact is achieved, Harris showed a series of slides and videos showing what Edwards AFB does. Under Brig. Gen. Carl Schaefer, 412th Test Wing commander, Edwards AFB hosts a wide array of test programs. For instance, the F-35 Joint Strike Fighter is nearing the end of its system development and demonstration phase and is going into its follow-on modernization program. Meanwhile, the new Air Force KC-46 tanker is preparing to replace the KC-135 Stratotanker, a President Dwight Eisenhower Administration weapons system. The work on these test programs is done by a mix of employee types. More than half of the Edwards AFB workforce are Department of Defense civilian employees, but there is also a large population of contractors and uniformed military members. “This is not like any other Air Force base in the world. We have a very highly skilled, very highly motivated workforce who get to work on, frankly, the coolest things in the world,” said Harris, who is in his third assignment at Edwards. Harris also noted how Edwards AFB and U.S. Air Force Plant 42 in Palmdale host a number of tenant units from Air Force, DOD and other government agencies as well as foreign partners. With all of that, Edwards AFB is only part of the Air Force Test Center. The AFTC is spread out across 31 different locations around the country with an annual operating budget of around $2 billion. There are three major installations with a variety of tenant units as well as over 160 ground test facilities and 12 unique test cells not found anywhere else in the world. According to Harris, the AFTC manages around $31 billion in taxpayer money in the form of infrastructure and resources and operates over 100 aircraft types. Besides Edwards AFB, the other two major AFTC installations are Arnold AFB, Tennessee, and Eglin AFB, Florida. At the Arnold Engineering Development Complex, ground testing is conducted with a multitude of simulated environments. For example, the humid and salty conditions of the ocean are replicated to test how they will affect jet engine performance over the lifespan of that engine. At Eglin, they’re known primarily for their munitions and cyber testing. Additionally, an F-35 could be tested under a range of climatic conditions from a sand storm to a blizzard to extreme heat at the McKinley Climatic Laboratory, also located at Eglin AFB. “I’m not going to lie, it’s a pretty cool job,” remarked Harris. He went on to explain that the success of many of these programs is largely impacted by the communities that surround the bases.